Having needed some 40 years to recover from the effects of a really BAD high school history teacher, Kerry Bryan discovered a love of historical research just a few years ago while taking graduate courses at the University of Pennsylvania. Her Civil War epiphany occurred when she went as a spectator to the 145th Gettysburg Battle reenactment in 2008 because her brother had come up from North Carolina to participate as a Union soldier. She began reading about the Civil War and hasn’t stopped since! 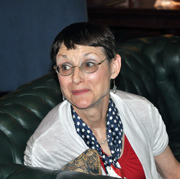 Kerry has been a member of the Old Baldy Civil War Round Table since July, 2009, and belongs to numerous other local historical institutions and societies. Since the meeting fell on June 14th, which is Flag Day, Kerry prepared a PowerPoint presentation called “A Salute to Old Glory: The Story of the American Flag.” Kerry gave a great presentation on the History of flags and of our flag—what the flag has meant to this country. Ours is the only country that has a “Flag Day” and a “Pledge of Allegiance” to that flag. She talked about the design of the first American flags and a little on the “Betsy Ross” story. 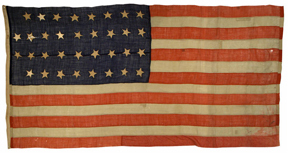 The choice of colors, stars, stripes and the overall design and its migration into what it looks like today and what it means to its patriots today. The history of our flag actually incorporates the history of the people of this country. This entry was posted in Meeting archive on June 14, 2012 by hlj.